Notes: Oh Aidez. I diligently swatched before leaving for Madrona. I made a good sized swatch. Then started knitting a few weeks later. 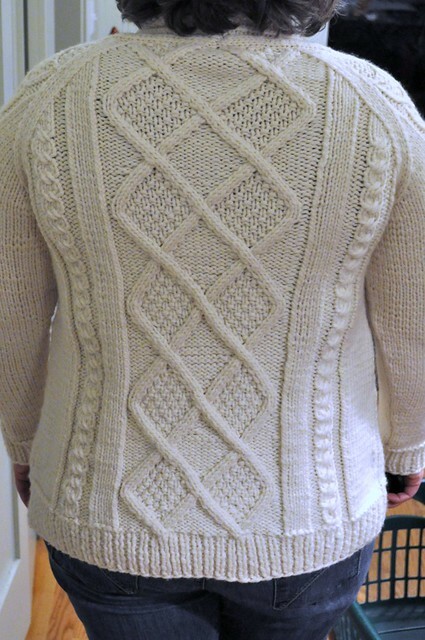 The pattern calls for a 10.5 needle which I think I used to swatch and knit the back of the sweater. But somehow when I had completed the back, both fronts and 3/4 of both sleeves I noticed that I was using a 9. What happened? I have no idea. I really, honestly don't have a clue whether I knit the whole thing on the wrong size needle or just parts. The ironic thing is I used up all my yarn so if I had used the correct needle size I would have run out of yarn. The resulting sweater is too small as you can see from the photos. The body is okay but the sleeves, which many knitters have said come out too small so I made adjustments to get bigger sleeves, are still too small and the fit through the shoulders is snug. It's a lovely sweater though. The yarn is soft and creamy. The design is beautiful. Sigh. Wowzers! What a beaut of a sweater and great work, nonetheless. Seriously. Rotten luck about how it's too small. I'd still wear it if you can. Is it possible to buy some more yarn and do something weird like cut into the shoulder bands and make them wider? No, I'm not insane, and I know it wouldn't be the right dye lot and all, but maybe you could just pull it off. What a bummer! But from here, it looks great. I'd still wear it if I were you. I agree with Amy, it looks great on you from here. What a beautiful job! I have done the same thing where I think I am using one size needle and then discover at the end of the project that I have a different one in my hand. Even as I think I see it binding a tiny bit across the shoulders, I do think it is really flattering (not too fitted). I know you had a looser fit in mind but it really does look quite lovely on you. Looks lovely!!! 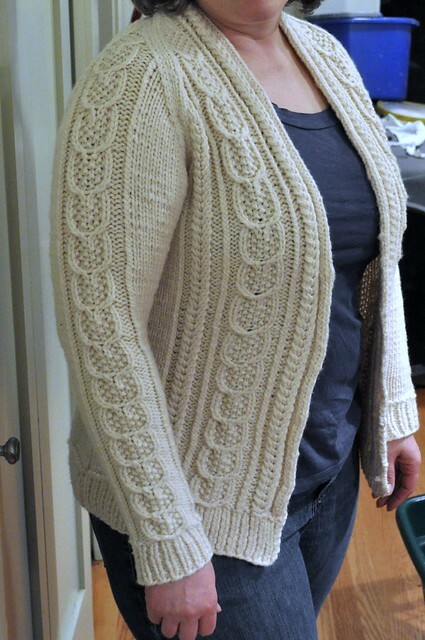 This is in my queue to knit!